HJ: Leaving your comfort zone is one of the single greatest things you can do to evolve and grow as a person and move your life forward. If you are feeling stuck, frustrated, stagnant or bored then it is imperative you get outside of your comfort zone immediately. These are all signs you have stayed there a bit too long. Don’t worry though, even the you are moving beyond the limits of your current realm of comfort, doing so will help you find a ‘new center point’ — a new zone of comfort that is richer, more fulfilling, and more expansive than the one you currently inhabit. You see, most people have grand visions for themselves — living empowered conscious lives filled with financial abundance, love, happiness and health — but are unwilling to leave their comfort zone to get there. If you want something that doesn’t exist where you are currently at in life, you are going to have expand and grow — evolve into the person you want to become — in order to get it. This is LIFE happening to us and helping us to continue moving forward — learning, evolving, growing, healing, self-actualizing… when we otherwise refuse to do it out of fear or laziness. However, when you take the initiative and consciously move beyond the limits of your comfort zone of your own volition, then the process becomes empowering… the process transforms into a learning experience and you come to enjoy it, rather than feel frustrated or that you have been the ‘victim’ of some random event or circumstance. The article below is intended to help you move beyond the limits of your comfort zone with ease and grace so that you can begin living the amazing, empowered conscious life that is totally within your reach. I’m sure we’ve all read plenty of quotes and articles about the importance of escaping your comfort zone, but what exactly is a comfort zone? What are the benefits of escaping from our comfort zone? And, how do you actually escape from it? Your comfort zone is an artificial mental boundary, which gives you a sense of security and feelings of — well — comfort. Within this artificial comfort zone, everything is routine, familiar and safe. Inside our comfort zone we rarely seem pushed, unlock our full potential or achieve what we’re capable of. Often, people will stay in a job or relationship just because of its familiarity, security and the fact that the unknown can seem extremely daunting. After all, why break a routine if it’s comfortable? Though the comfort zone is an artificial boundary, there’s plenty of research and science to back its existence and effects on human performance. Have you even been in a situation where the pressure has been on you? Maybe a presentation to your boss or a potential client; a first date with someone you really want to impress or an impending deadline you see as impossible? I think we’ve all been in one of those situations (or similar) at some point in our lives. Just when you feel the last thing you need is a bit of anxiety or some last minute nerves, they kick in; you start to question yourself and fear the worst; What if I don’t finish this work in time? What if she doesn’t like me? It may feel like the end of the world is approaching, but actually, a little anxiety is a good thing. Just outside of our comfort zone lays a space called “optimal anxiety,” it’s a sweet spot of human performance and place where we’re motivated to succeed. Similar to an athlete who has just prepared and warmed up for a big game, optimal anxiety is the space where we are ready to perform at our best. The theory that anxiety can aid performance is not something new, the idea goes back to at least 1908 when Robert Yerkes and John Dodson released a study showing that arousal (anxiety) increased performance. 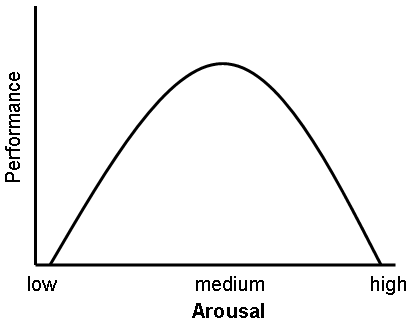 The study also shows that only certain levels of arousal are good for performance, too much has the opposite effect and is detrimental to performance. Therefore, pushing ourselves too hard, too often can also create a notion that challenging ourselves is a negative thing and re-enforce our desire to stay within our comfort zone. Your comfort zone isn’t a bad thing; it’s far from it. We all need a space where we can relax, feel at ease and comfortable. So why should we push ourselves outside of our comfort zone from time to time? Sometimes a dream can seem a step too far and unachievable. Often this will put us off chasing the dream and we’ll settle for the mediocre (or what is achievable within our comfort zone). As illustrated by this inforgraphic from Marcus Taylor, as we push ourselves outside of our comfort zone into optimal anxiety and our ‘growth zone’ challenges will become easier and our comfort zone expands. Eventually, things that previously scared us will become part of our growth zone, then move into our comfort zone, thus helping us achieve more than we previously thought possible. Comfort can lead to laziness, and as we’ve already touched on stepping outside of our comfort zone can lead to heightened activity and optimal performance. Comfort may feel good in the short term, but as Ran Zilca, explains onPsychology Today, sacrificing productivity for comfort may lead to regrets in the long run. Sometimes we’re forced to leave our comfort without any choice. The more you push yourself to do things you wouldn’t normally do and experienced uncertainty in a controlled manner, the better you’ll be able to deal with un-expected situations as they arise. 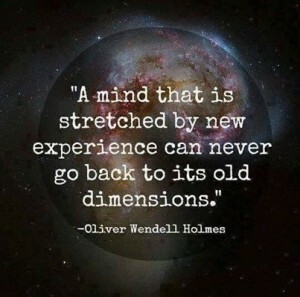 Pushing our boundaries, new experiences and learning new skills are great ways to inspire and educate ourselves. 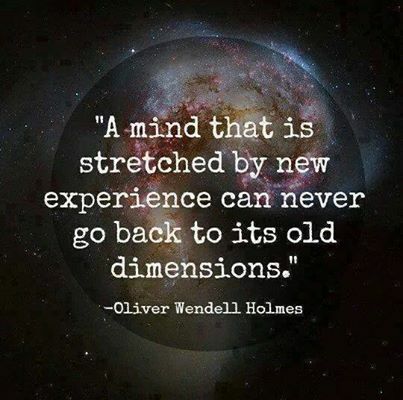 With new experiences and leanings behind us we can start to look at old problems in new ways and come up with new creative solutions. Most of us have a set daily routine, by making small changes to this we can push ourselves to step outside of our comfort zone. You don’t have to make huge changes; small subtle differences in your day-to-day routine can be enough to change your perspective. If you run everyday, you could push yourself to go an extra mile tomorrow. If you get a coffee every morning before work, why not try a new flavour or get a fresh fruit juice instead. Maybe you want to start your own business or quit your day job to pursue your passions. These may seem like unattainable goals, you may fear making a bold move, but if approached in small steps you can slowly push the boundaries of what you feel is possible. As Lewis Howes explains in this Forbes article, “If your goal is to “start a business” — change it to “interview one business owner.”” By taking an initial step outside your comfort zone will help you move towards your greater goal. Leaving your comfort zone isn’t about getting something right first time, it’s about extending your horizons and allowing yourself to grow — no matter what the iniatial results may be. Try new things can be as simple as new foods or bigger things like travelling to new places, taking a new class or learning a new language. What have you done that’s taken you outside of your comfort zone? Ashley Readis a freelance social media strategist, community manager and aspiring writer. Find out more about him here.